Students, teachers and designers came together to participate in the annual weekend-long event put on by Techstars and Grow with Google. They holed up for a cumulative 54 hours in the Seattle Public Library’s glassy downtown branch. Their mission? To find solutions to some of the most pressing issues facing students and educators. 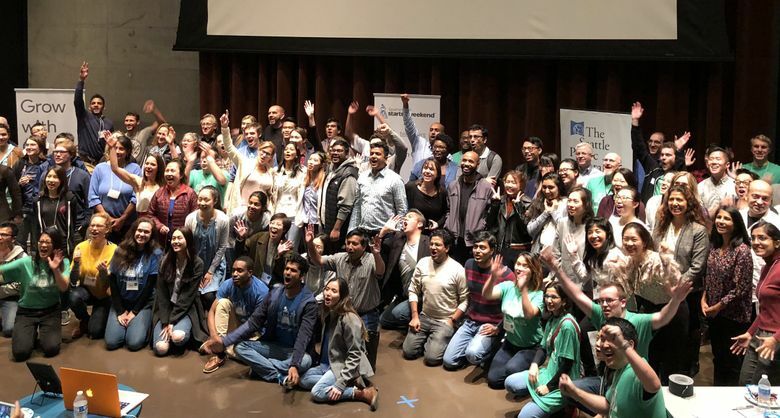 The students, teachers and designers came together to participate in Startup Weekend EDU, an annual weekend-long event put on by Techstars and Grow with Google meant to deploy entrepreneurship to fight against educational inequity. Participants spent the first day, Friday, pitching problems before forming teams to devise solutions. “We’ve noticed that at Startup Weekend EDU, teams are more successful at understanding their customer and designing a solution if they focus on the problem first,” the instructions read. After choosing a problem and splitting up into teams with other dedicated strangers, participants spent all of Saturday designing a fix and preparing to present their concepts to a panel of judges Sunday evening. High-school students have to do a lot of box-checking to ensure they graduate on time, but community service should not be just another chore. The team behind Come.unity believes students can be passionate about required community service if given the right options; the judges said they agreed when they awarded the team the grand prize. The app is designed to make community-service opportunities easier to find by tailoring them to each student’s interests. An introductory survey has users select subjects they care about, from sports or food to the environment or the arts. Come.unity then connects them to relevant local opportunities. The winner for best execution, OWL is a Google Chrome extension that tests students’ comprehension of any topic they browse online. The extension has three options for testing knowledge about the webpage you’re on: quizzes, “insight links” on the subject or related coverage across the web. If a subject isn’t well documented in the OWL database, users can contribute questions and annotate webpages. “Different things trigger understanding for different people,” Herman said. A significant number of teen mothers never graduate high school, and the team behind Pacifier in a Backpack wants to change that with a community-based app that provides health and academic resources, plus emotional support from other teen mothers. While researching the idea, the team found preventive materials on teen pregnancy, but little support for already pregnant students. The app won the award for best education impact for directly addressing inequity among a specific segment of students. The winner of both the audience favorite and best-in-design awards, Don’t Be Broke is an app and curriculum aimed at helping students graduating high school understand how to manage their finances. Edwin Singh, now a data specialist at Expedia, majored in finance during his undergraduate years and was inspired after seeing how many of his friends would ask him for basic financial advice. “I’m hoping the impact is improving how kids learn about finances, but also defusing misconceptions about millennials being irresponsible with money,” Singh said. Judges praised Singh’s team for successfully surveying 85 young adults in the Seattle area, ages 16-25, over one weekend. The large majority of those surveyed had low confidence in the effectiveness of financial education in school, whether they had gone to college or not, confirming the team’s suspicion of a demand for its product. Participants in Startup Weekend don’t have to continue working on their ideas beyond the event, but the connections established with their teams and other participants are invaluable if they decide to.